DON'T MAKE A MOVE WITHOUT appreciating all this home has to offer! Chichester Subdivisions newest listing features a formal dining room, main floor office (with built-in bookshelves) Bright open kitchen with eating area & granite counters, formal living room and family room with a gas fireplace. The entire home has been professionally repainted and has new carpet on the main floor. Master bath ensuite, with his & her closets. All bedrooms upstairs are spacious with plenty of closets, direct access to main bathroom great for guests! The finished basement is a perfect entertaining spot. All appliances included, which includes a refr, conv. oven, double oven, microwave, electric cooktop. Washer & dryer & basement refrigerator Gutter guards, sprinkler system. New Humidifier. Private lot has loads of perennial gardens and mature trees. 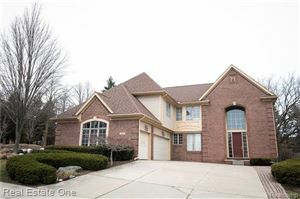 Close to the Village of Rochester Hills, Historical Rochester, and Paint Creek Trails. Award-winning Rochester Schools. HWA home warranty for peace of mind.